…vices of the past year, eradicating them with each purifying knell! 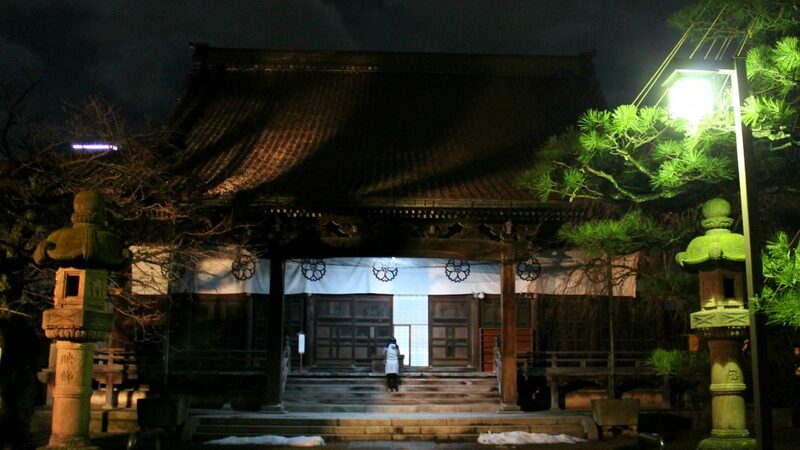 As midnight approaches in Japan, temples throughout the country strike their iron bells 108 times. 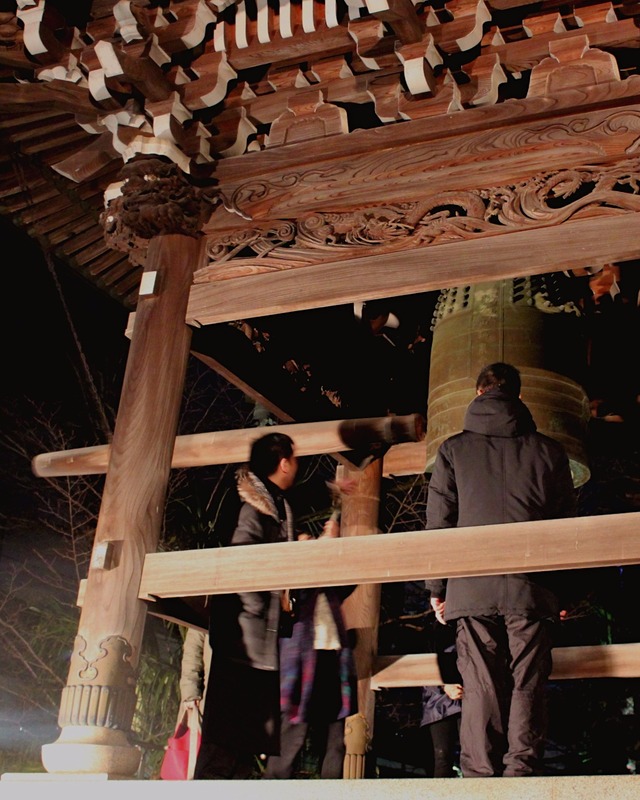 Joya no Kane, literally “New Year’s Eve Bell,” starts before midnight of the new year. At the larger and more remote temples, the timing of the strikes are precise, aiming to ring the bell 107 times before midnight and once after. 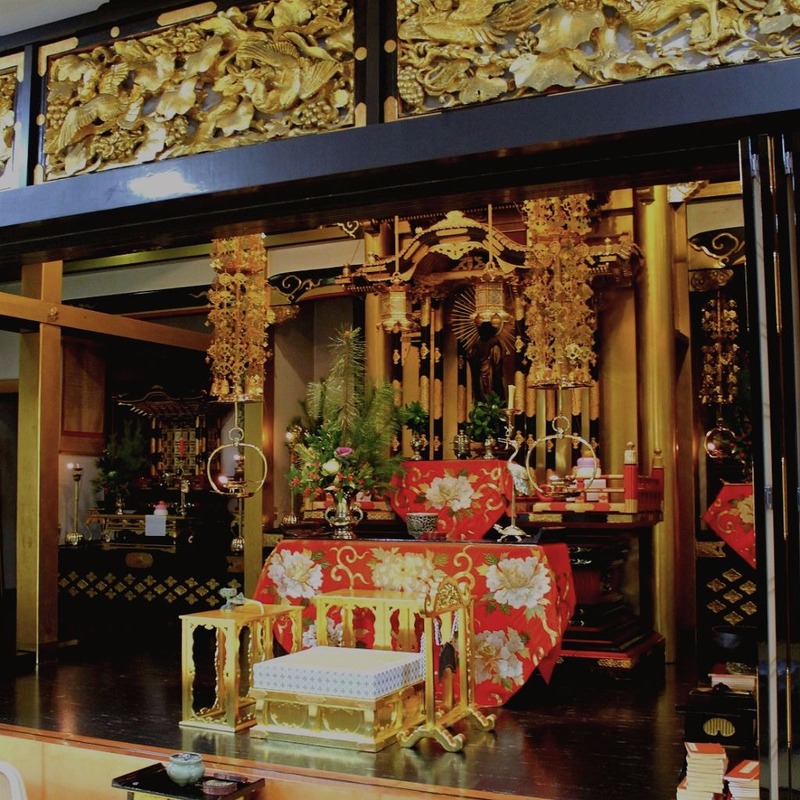 Smaller temples are more flexible, especially as temple visitors are invited to participate. But which temple should you visit? The largest of Kanazawa’s three temple districts, Teramachi (a.k.a. 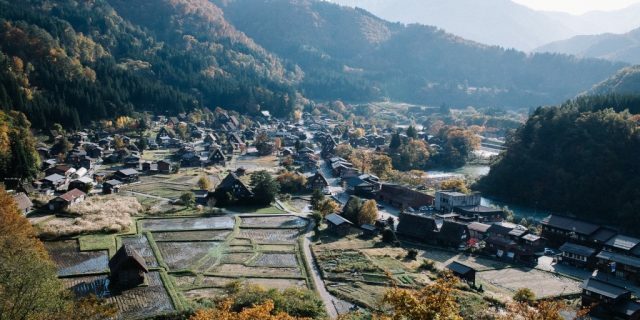 “Temple Town”) is just on the other side of the Sai River from Kaname Inn. We recommend wandering the temple district as you follow the sound of a bell to the temple that calls you. I did this last year and enjoyed it immensely. Meaning “Temple of Eternal Virtue”, Joutoku-ji is a tiny, family-oriented Shin Buddhist Temple where the people were especially welcoming, allowed multiple strikes at the bell and an open invitation inside. 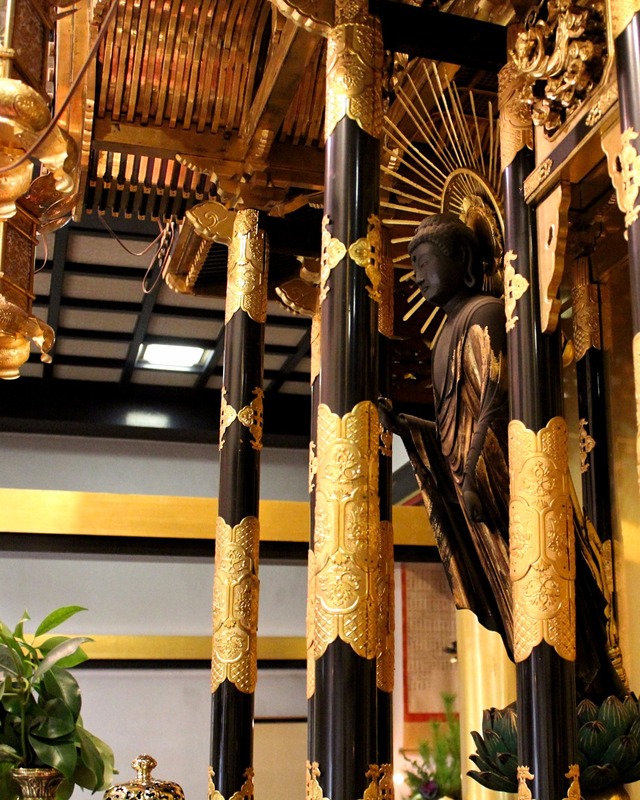 They even gave me a tour of the modestly-sized—if exquisitely ornate—worship area, where the pioneers of Japan’s most common Buddhist sect are honored, and the Buddha leans forward to welcome prayers. After enjoying a hot tea by Joutoku-ji’s heater and conversation with other temple-goers, I headed out and followed another bell to Zuisen-ji (“Spring of Good Omens Temple”), a larger Shin Buddhism temple close to Nishi Chaya Gai (the western geisha district). The worship area was closed, but the bell ringers were busy with visitors, and I spent extra time in awe of the wood carved lions and dragons that upheld the bell tower roof. For a larger temple experience, be ready to travel by bus or car. Nearby larger temples we recommend for Joya no Kane include the zazen meditation temple Daijo-ji or the “Princess Temple,” Tentokuin. In Shinto practice, nearly everything has a kami, a kind of spirit or deity. There is even a kami for each year, with the new taking on the mantle of the old. During the first five days of the new year, Japanese residents make their way to one of the city’s major shrines to welcome the new god in the Shinto practice of hatsumode. 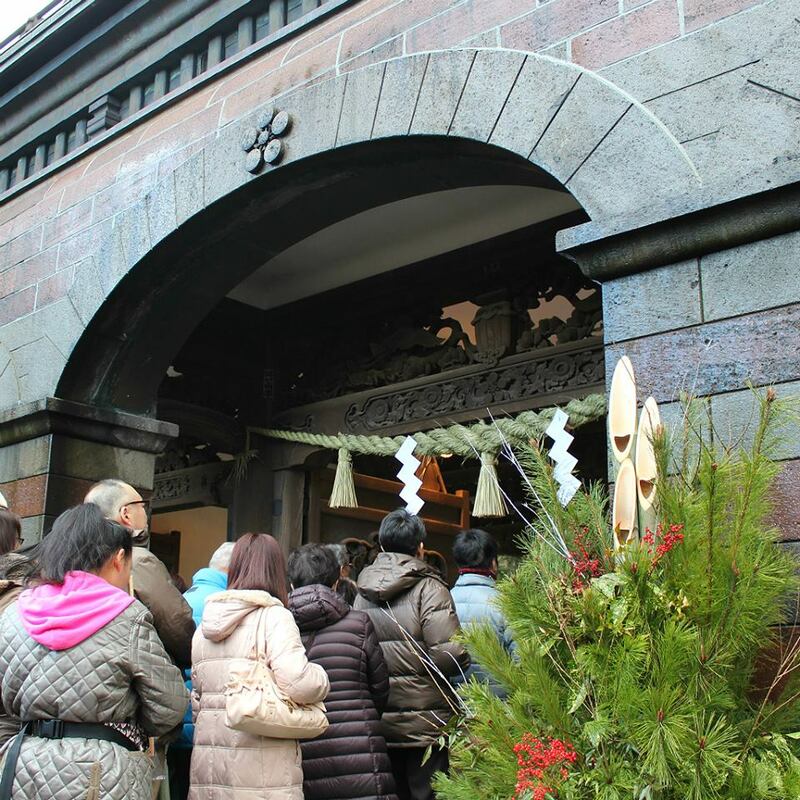 Over the New Year holidays, kodomatsu, or “gate pines,” decorate the entrances to shrines and other buildings in Japan. 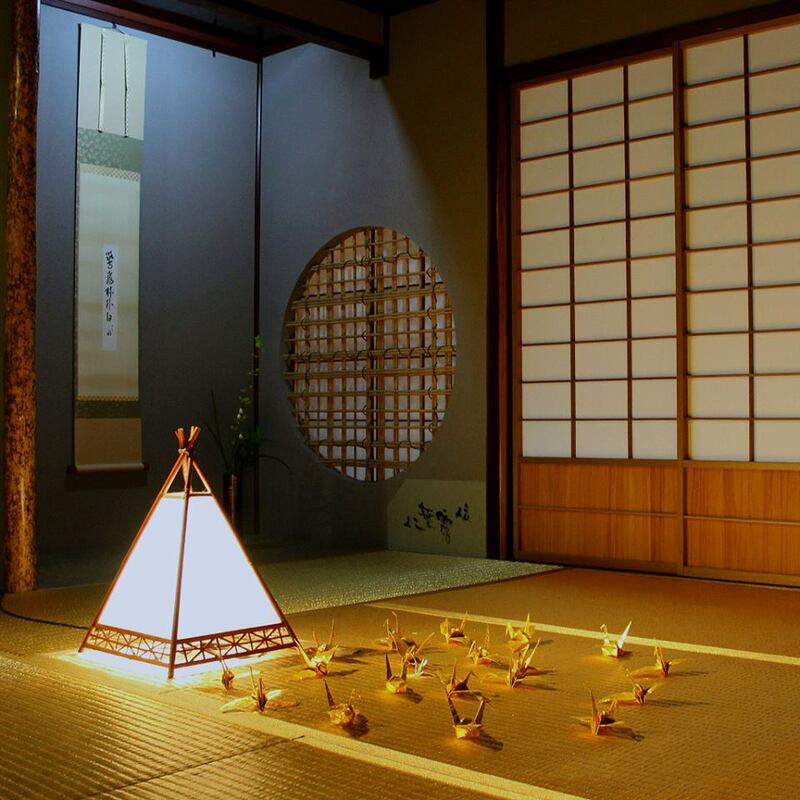 These seasonal ikebana welcome and even house kami spirits during the festive season. The three off-set bamboo represent Heaven, Earth, and humanity. 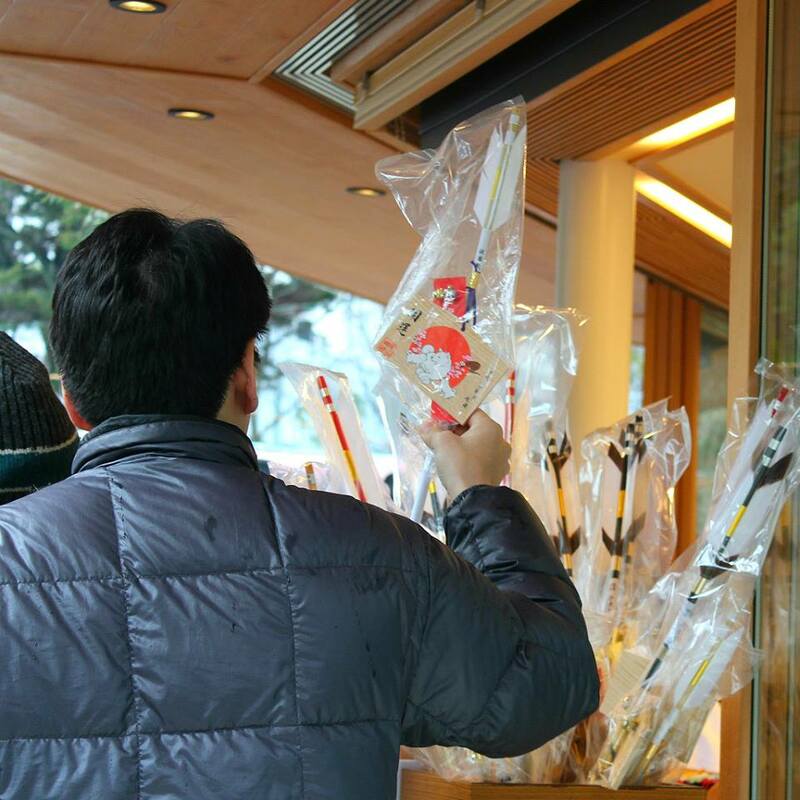 Among the many charms sold at shrines are new items especially for the new year: hamaya, an arrow to ward off misfortune. These are usually placed at home shrines. As you walk into the shrines, omikuji, paper fortunes, are organized near the front. Select one to match your birthday and pay 100 yen to the nearby coin deposit. You will receive a blessing (吉) or a curse (凶) of a various size, small (小), moderate (中) or great (大). You might also get a half blessing or half curse if you see this character: (半). Your fortune will come later if it’s marked for the future (末). If your fortune is bad, tie it to one of the shrine’s strings. This practice comes from a Japanese pun. 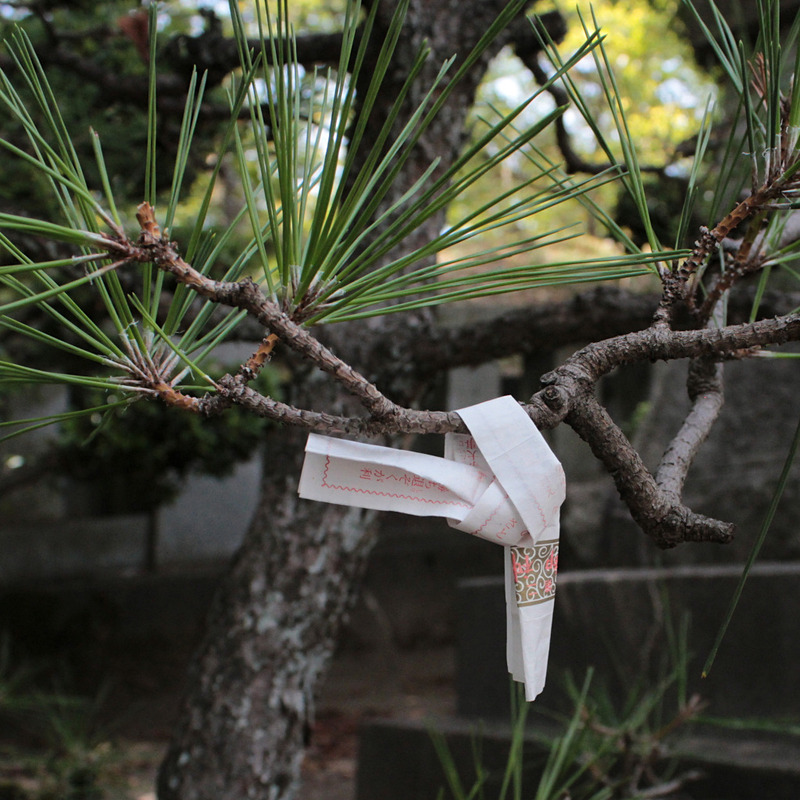 Matsu can mean both the verb “to wait” and the noun “pine tree.” Traditionally bad omikuji were tied to pines in order to have the fortune “wait” by the tree rather than attach itself to the person. 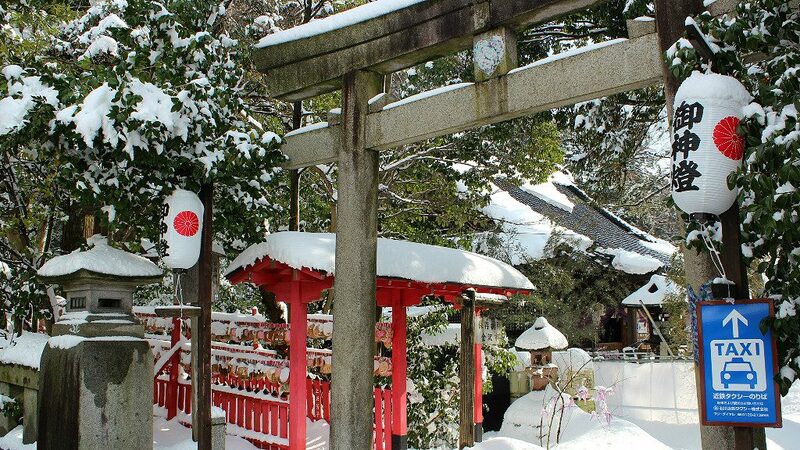 Oyama Shrine is, of course, the go-to shrine anytime of the year. That should be no surprise, with its extensive history and grounds that serve as much as a gallery as a place of worship. 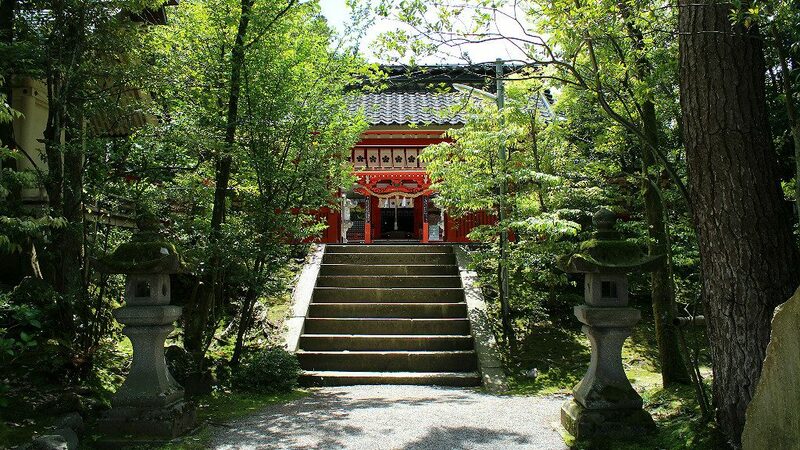 The grounds have more breathing room than the equally popular Ishiura Shrine (see below). 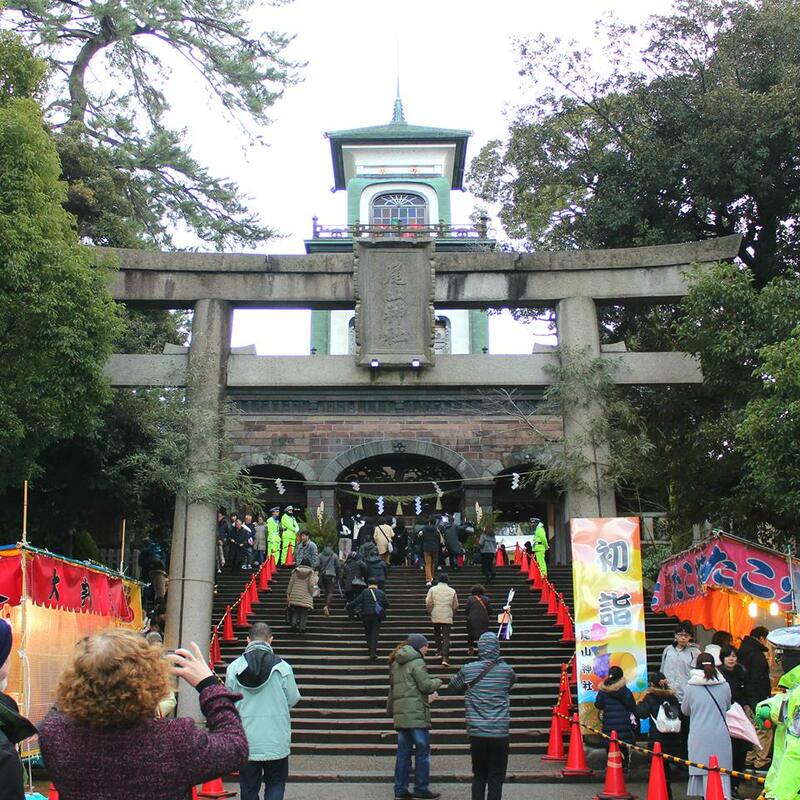 A number of food, drink and entertainment booths open up within and in front of the shrine area. Be sure to check out the shrine shop for a variety of charms and Chinese zodiac tokens. The oldest shrine in Kanazawa is nestled at the foot of the Honda Forest, slightly obscured from view. Just as popular for hatsumode for locals, this shrine sees less foreign tourists. 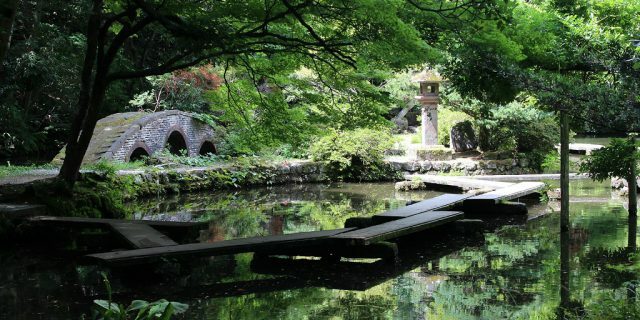 Yet, its location is perfect for visitors on the way to enjoy Kenroku-en Garden or Kanazawa Castle Park. 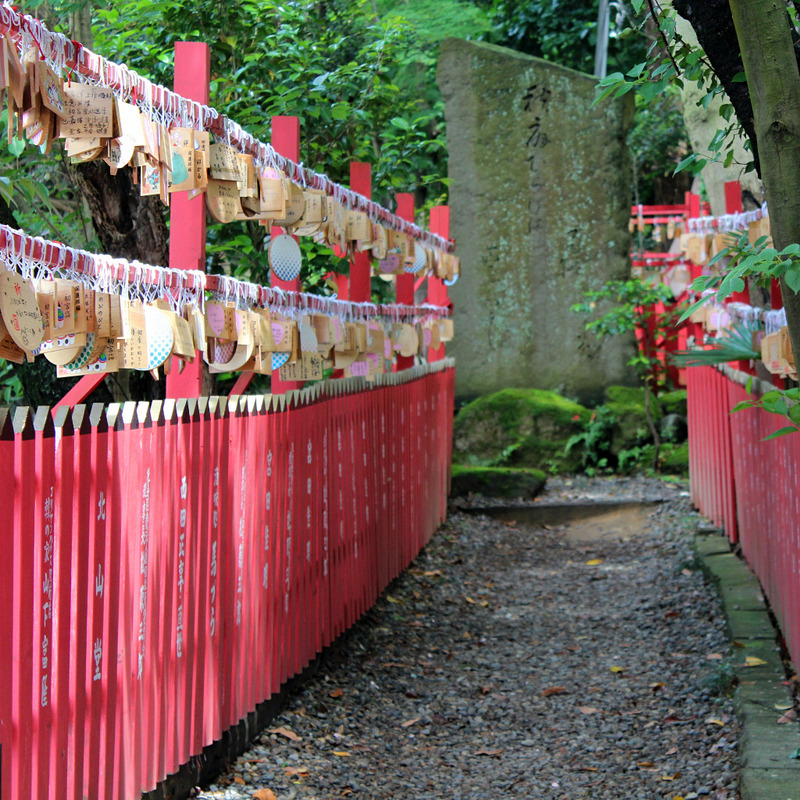 From Ishiura Shrine, follow the red pathway of dangling wooden enma, prayer boards, uphill to the backside of Kenroku-en. 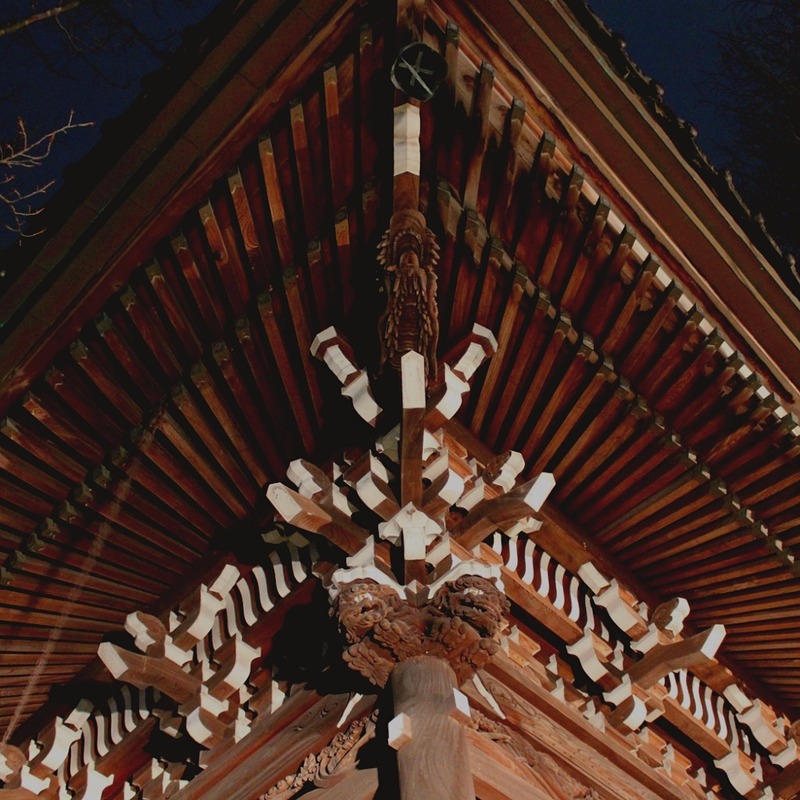 Named after the city itself, Kanazawa Shrine hosts a deity of scholarship and is a favorite among students. To one side is a sacred well established in honor of the legendary well from which Kanazawa takes its name. 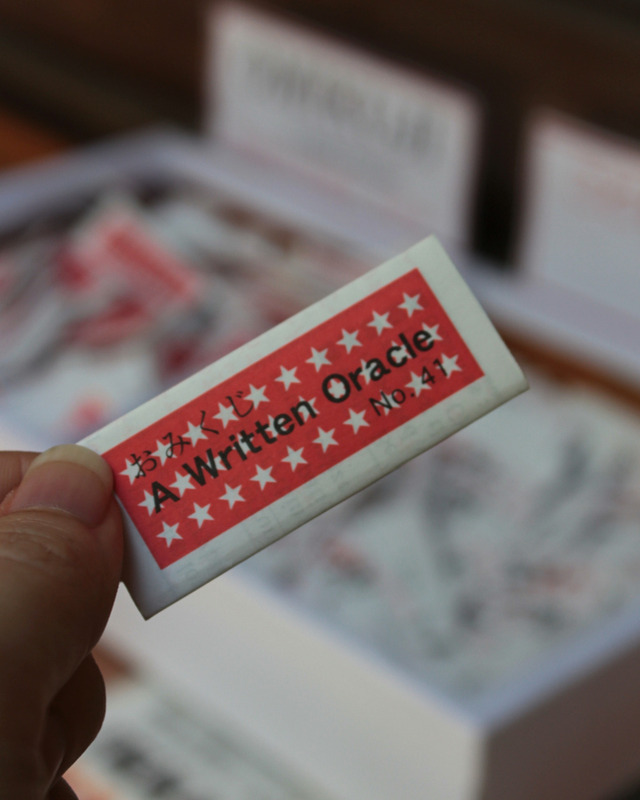 In addition to enjoy the charm of a small, but well-loved historical shrine, take this opportunity to grab an omikuji in English! 2019 Dezome-shiki Show: January 6th, 10:00 a.m.
Samurai often entered civil servitude in times of peace. 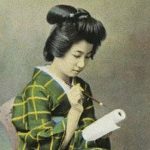 Fighting fires suited their sense of bravery and physical fitness, and for more than 300 years, the firefighters of the Kaga region, called Kaga Tobi, or “the Black Kites (read: Hawks) of the Kaga Region,” have readily displayed theirs in grand shows. Climbing atop bamboo ladders, they suspend their bodies over the ground below, held aloft by only one or two points of contact. Their reputation is such that an entire line of sake is named after them, produced by Kanazawa’s oldest brewery, Fukumitsuya. 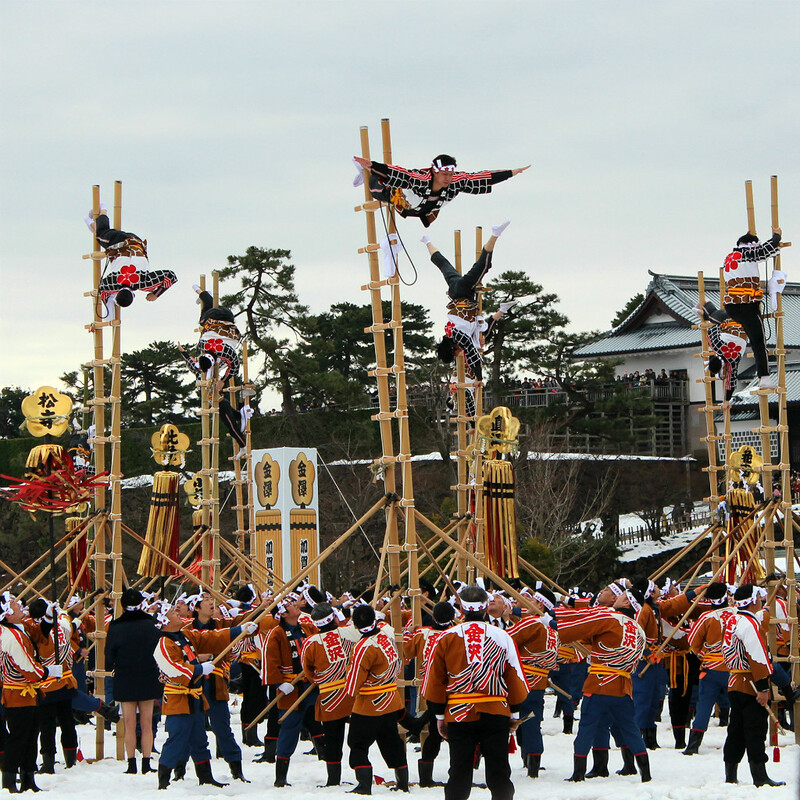 Kaga Tobi demonstrations happen several times a year, including along the parade route during the Hyakumangoku Festival. The Dezome-shiki event is particularly special for the time of year in which it takes place. Here at the start of a new year, after a full display of their ladder acrobatics, the firemen strip down to traditional loincloth undies, fundoshi. They race to set up hoses, pulling water from the castle’s natural pond nearby, and spray the air, raining freezing water over themselves and anyone foolish enough to dare too close. The entire show starts in the morning on the north side of Kanazawa Castle Park. For a good spot, come early. Photographers, bring a step ladder and be aware that melted snow may make the ground soft and muddy. Pomp and circumstance from city officials take up the first half hour, and then the real show begins. What’s open for New Years? 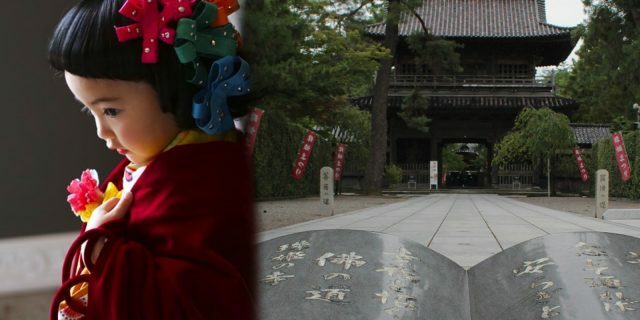 Visiting Japan during the New Year is incredibly special if you’re participating in joya no kane or hatsumode. But, as New Year is such an important holiday for Japan, many shops and restaurants close so that members can spend time at home. However, that doesn’t mean that some lovely sightseeing can’t be had. Kenroku-en Garden and Kanazawa Castle Park, including the miniature strolling garden Gyokusen’inmaru, remain open through the holidays. Go early to catch plenty of daylight and, weather permitting, lovely snow. 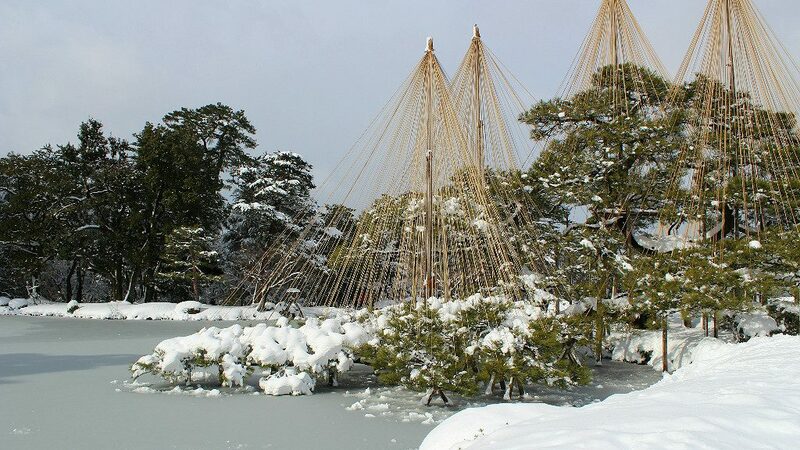 Unique to the wintry time of year are the yukizuri: traditional bamboo and hemp tree suspenders that hold branches aloft under the weight of fallen snow. Additionally, the straw mat protections hung on the walls of Nagamachi, a.k.a. 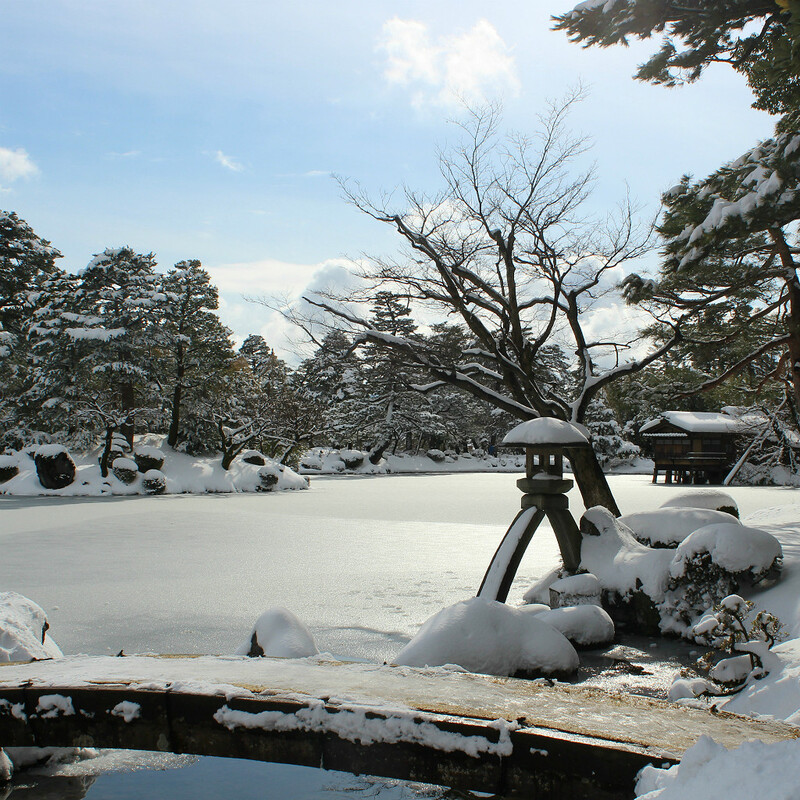 the “Samurai Residence District,” are a winter-only sight. 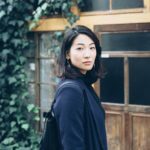 What’s more, the neighborhood’s most popular spot, the Nomura Samurai Family Residence, is open during New Year, having instead taken two days off December 26th and 27th. The nearby Chinese pharmacy museum, the Shinise Kinenkan, with its collection of traditional medicines and Kanazawa craft-works, is also open through the holidays. The neighborhood resthouse and, a little further away, the Ashigaru Shiryokan Museum are both open 365 days a year. Here in the latter, in the spaces where samurai foot soldiers lived and tended small garden plots, you get a sense of how rough winters without modern comforts could be. In Higashi Chaya, many small shops and restaurants may be closed. 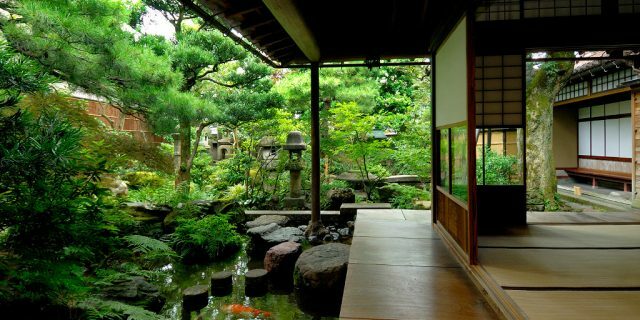 Tea house Shima is open 365 days, as is the elegant geisha house, Kaikaro. Convenience stores remain open through the holidays. A select few restaurants are open, usually non-Japanese or chains. It’s a perfect time to eat steaming hot bowls of ramen with both Ippudo and Hachiban Ramen nearby. (For those with pickier little ones, a McDonald’s is just down the street from us.) Grocery stores also close for New Year holidays, so plan ahead with extra purchases if you’re cooking. It’s customary to eat soba noodles on New Year’s Eve, so if you’re eyeing any soba restaurant that happens to be open December 29th, expect it to be packed and book in advance. For a truly traditional Japanese experience, order osechi ryuori, a massive bento prepared in a traditional fashion specifically to last a family through the holidays. Most items are sweet, salted, pickled or otherwise fermented to prevent decay, and all are delicious. 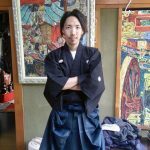 Most shops and restaurants that can prepare osechi ryuori require a December 31st pick up, with varying order-by dates. Expect to drop anywhere from 10,000 to 50,000 yen for the set. 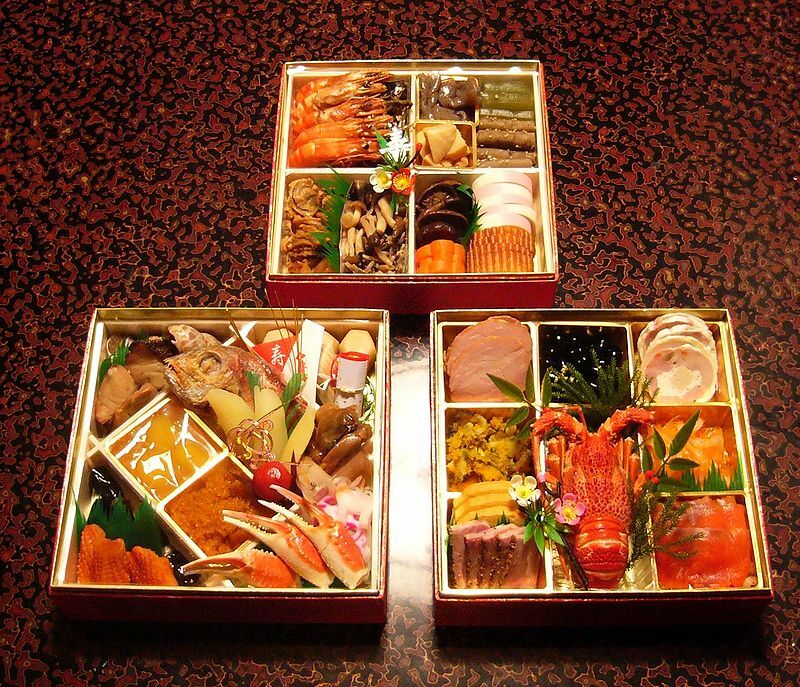 Nearby, Kiku Yoshi and Kanazawa Tamazushi can make traditional osechi ryuori sets. For osechi sets with a more western spin, Budoonoki offers several. 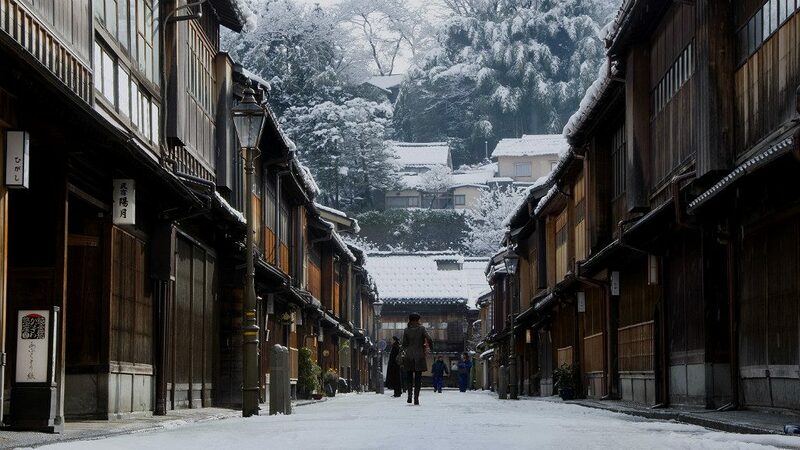 The snow in Kanazawa can be unpredictable in advance. Last year saw one of the heaviest snows in decades, and the year before barely any. Often the snows bookend the New Year holidays, meaning less of a winter wonderland, but also less slush. So what can you count on? 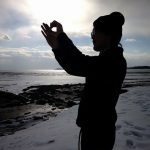 Generally the temperature lingers above zero, and in humid Kanazawa, that means the air is even more chilly. 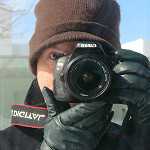 Layer up with an easy slip-off coat, as many businesses will blast the heaters. Carry lip balm. Waterproof boots are best. Layer on wool socks, including toe-socks, inside a pair of tall boots with your pants tucked in and people will tell you you dress like a local!